Welcome to this Spanish Peaks luxury corner condominium! It has a prime location on the 18-hole, par-72 golf course designed by Arnold Palmer, and has biking, walking, and running trails out the back door. In the winter, it is on the world-famous Lone Mountain Ranch cross-country ski trails -- 65 kilometers of groomed trails literally out your back door. Plus, you are just 10 minutes away from Big Sky Ski Resort with 85 miles of named ski runs, no lift lines, and lots of powder - 500 inches last year! This brand new 2,300 plus square-foot condo has three bedrooms and three baths located on three floors for plenty of personal space. It is professionally decorated with marble countertops in the kitchen and all three bathrooms, and hardwood floors in the main living area. The master bedroom boasts a king-size bed and bathroom en-suite. The 'second' master bedroom has a queen-size bed, and the third bedroom sports a fun trundle bed for kids. The three bedrooms and two of the bathrooms are on the third floor. The second floor has an open floor plan with gourmet kitchen with quality appliances, dining room with seating for 10, a beautifully furnished living room with giant stone fireplace and satellite TV, and an office area with free DSL modem. The laundry room with large-capacity washer and dryer is also located on the second floor. The first floor has a heated two-car garage with workbench (for waxing those racing and skating skis), a bathroom, a spacious entryway with closet for coats and boots, and a family room with sofa-sleeper, TV and game table. Both TVs have DVD and video players Because the condo is part of the Spanish Peaks development, renters have access to the Spanish Peaks Clubhouse. The clubhouse has a full kitchen, wide-screen TV, two spacious changing rooms, and adjoining hot tub and outdoor summer swimming pool with views of the golf course and Lone Mountain Peak. 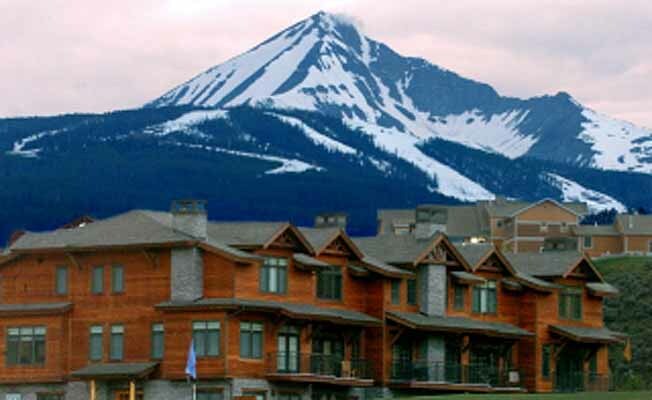 Winter in Big Sky provides incredible downhill and cross-country skiing and snowboarding. You can also enjoy sleigh-ride dinners, dogsled adventures, snowshoeing, and snowmobiling. Summer offers golf, hiking, rafting, mountain biking, horseback riding, world-class fly-fishing on the Gallatin River, and a beautiful 45-mile drive to Yellowstone National Park. Or, just kick back on the deck, read your favorite novel, and enjoy the Montana wildlife that lives nearby. This luxury condo is managed by Alpine Property Management, which provides easy check-in, information about local activities, discount lift tickets, maintenance 24-hours a day, linen changes, and weekly cleaning.